Ben Goes Green! Episode 2! So I offered myself a compromise. 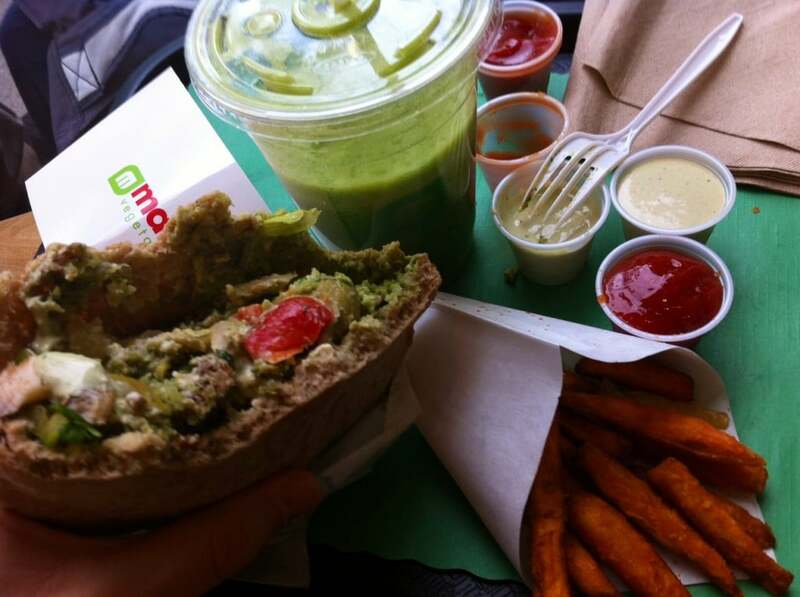 I went to Maoz Vegetarian for a falafel sandwich (5 pieces of falafel on a whole wheat pita with hummus) and sweet potato fries, and a fresh Kale,-Apple-Celery-Lemon juice. Sure, falafel and pita and fries… More brown, and fried at that! But I got my kale juice, I asked for spinach in my falafel sandwich, and I loaded it up with carrots and olives and mushrooms and tabouli and stuff. So I felt okay about having this yummy meal, even if it was slathered in tahini dressing and ketchup. Tempted to get a General Tso’s Tofu for dinner, I realized it was time to have a real salad and get some real produce in my system. I went to the deli and got a spinach salad with shredded carrots, red onion, beets, mushrooms, green and red peppers, and extra black olives. 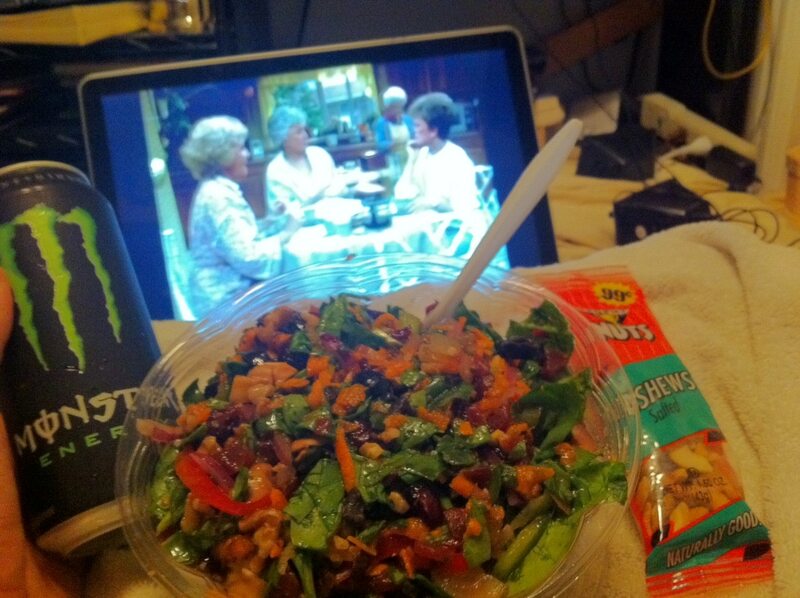 I topped it with walnuts and craisins and had the whole thing chopped to smithereens (he chopped it 186 times… Does anybody else count how many times the deli guy chops their salad?…. No?…… Just me?….. Okay). Tossed in a raspberry vinaigrette. It was delicious. Of course it was, as I knew it would be. I’ve had it before. The thing is, when I’m eating that way I want to continue eating that way. So hopefully I’ll continue eating a little greener. I also treated myself to a package of salted cashews and a Monster energy drink, as I had tons of photo editing and retouching to catch up on for a client. Hey! The Monster energy drink has a GREEN CAN okay? And as a dessert, I snacked on two mini ice cream sandwiches by So Delicious. As nothing makes me gassier than sweet potatoes and spinach salads with tons of raw veggies — you can imagine it was a musical night. Good thing I was alone. Oddly enough, I was listening to episode 42 of Red Radio, dubbed “The Pooping Episode” where I got to hear all about gas an bowel activity — and oddli-er still, I was even mentioned in the episode for my recommendations on gas and bloating. Another green day down! Crack a window, Honey.